A new tourist destination is soon to operate this summer season which will offer quintessential fun for visitors and vacationers in Baler, Aurora. Municipal tourism officer Riza P. del Rosario said the “Atlantis de Baler” will launch various activities dubbed as “Nakaka…Baler na Summer 2015”, a crazy summer experience which will start before the end of this month. Located at barangay Buhangin, del Rosario said the Atlantis de Baler will play a significant role to achieve more growth in terms of local tourism industry and to generate new job opportunities. “The Atlantis de Baler will introduce diverse sets of events this summer season which everybody will enjoy. It will kick off different events where the people will enjoy the nature-based adventures,” she said. Baler’s Singing Idol and Talentadong Baleryano; Kawal ko Mahal ko, a singing soldier contest and treats for men in service; Mother’s Day event – treat for Moms and Gandang Nanay pageant; 2015 Baler Open surfing competition; Baler bikini fun run; Grand Santacruzan 2015, Baler music fest concert; and others. Del Rosario said that Atlantis de Baler will donate part of the entrance fee collected to the following beneficiaries: ABS-CBN Lingkod Kapamilya, GMA Kapuso Foundation, Manny Pacquiao Foundation, Baler Catholic Church, Baler Home for the Aged and the Children; Baler free legal and medical consultation, barangay development, municipality of Baler and Baler tourism. Meanwhile, the management of Atlantis de Baler has vowed to prioritize to give work to unemployed people of Baler and new entertainment to the local and foreign tourists. Marvin dela Cruz, chief executive officer of Atlantis de Baler, said that he wants to help the municipal tourism in promoting the province through nature based adventures for the young and old. “We want to help organize major events to promote tourist resources here and carry out related business exchanges that would improve the domestic tourist market and to help organize major promotional events that would assist the municipal government of Baler to be well known not only in the country but worldwide,” dela Cruz said. 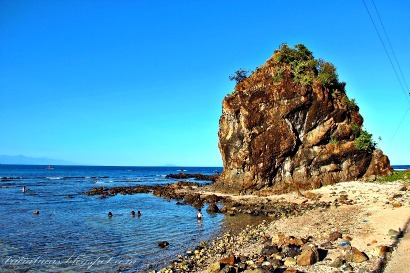 Atlantis de Baler is located in the area between the river and beach facing the Pacific Ocean in Barangay Buhangin which is unusual compared to other amusement and recreational places. Del Rosario said that through the municipal tourism office, Baler was featured in some television programs such as “Byahe ni Drew” – Andrew Arellano of GMA7; “Ang Pinaka Segment ni Roi Vilson”; Umagang kay Ganda of ABS-CBN: Solar TV-Something to chew”, UNTV, NET25 and the Office of the President. “Through these programs, Baler was introduced and featured. They said that Baler is not only for surfing but also a great destination for a romantic for couple, family and friends, an ideal place for vacation and self-internalization. It is gifted with rugged terrains, mountainous landscape and beautiful beaches that make it a haven for nature lovers,” she said.